← Join the New Year’s Eve Celebration at Walt Disney World Resort. Entirely New Theme Park Rides in Twentieth Century Fox World! A new theme park with COMPLETELY DIFFERENT RIDES has been unveiled by Twentieth Century Fox in partnership with Genting Malaysia. 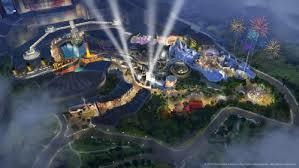 TWENTIETH CENTURY FOX WORLD will open at Resorts World Genting, Malaysia in 2016. Rides and attractions based on Twentieth Century Fox blockbuster titles like ICE AGE, RIO, ALIEN VS. PREDATOR, PLANET OF THE APES and NIGHT AT THE MUSEUM (additional rides based on movies to be announced at a later date). In addition, the theme park now has an official logo and a first-look at what visitors can expect from the park’s attractions was unveiled today at the launch of the TWENTIETH CENTURY FOX WORLD. Genting Integrated Tourism Plans were also presented at the ground-breaking event that was attended by the Prime Minister of Malaysia, the Honorable Dato’ Sri Mohd Najib Tun Razak, and executives from both companies. TWENTIETH CENTURY FOX WORLD will open in Malaysia in 2016 and will feature a fully immersive entertainment experience highlighting some of FOX’s most recognized and powerful film brands. In attendance at the event were Jeffrey Godsick, president of Twentieth Century Fox Consumer Products, Greg Lombardo, vice president of global location based entertainment at Twentieth Century Fox Consumer Products and Chairman & Chief Executive, Tan Sri Lim Kok Thay of Genting Malaysia. “We are investing $300 million to develop the world’s first unique and compelling world-class Twentieth Century Fox Theme Park. Having the distinction of being the first of its kind in the world, TWENTIETH CENTURY FOX WORLD will be built on a grand scale that consists of unique and creative concepts featuring more than 25 rides and attractions of a cinematic nature. The theme park will definitely pave the way for continued growth of Resorts World Genting with a next-level family entertainment experience which will attract tourism dollars to Malaysia,” said Chairman & Chief Executive of Genting Malaysia Tan Sri Lim Kok Thay. This entry was posted in Theme Parks and tagged them parks 20th Century fox, Twentieth Century Fox World. Bookmark the permalink. 1 Response to Entirely New Theme Park Rides in Twentieth Century Fox World!